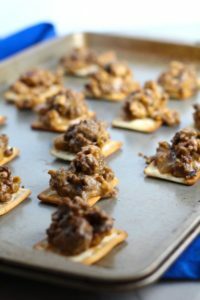 Hanky Panky Canapes, the Best Party Appetizers! 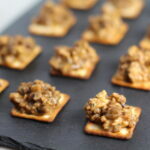 Looking for the perfect, easy, addictive, delicious appetizer for your next party? 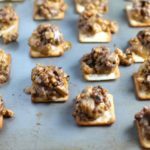 Look no further than these Hanky Panky Canapes, the BEST Party Appetizers around! They’re cheesy, meaty, and absolutely delicious. 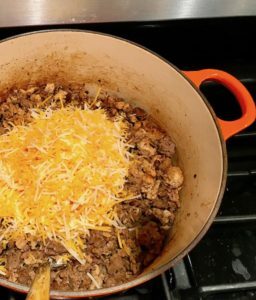 Ground Beef is mixed with Homemade Chicken Sausage and then combined with lots of cheese until its a creamy addictive pot of goodness. Then it is scooped on top of bread, toasts, or crackers, which makes it a canape. 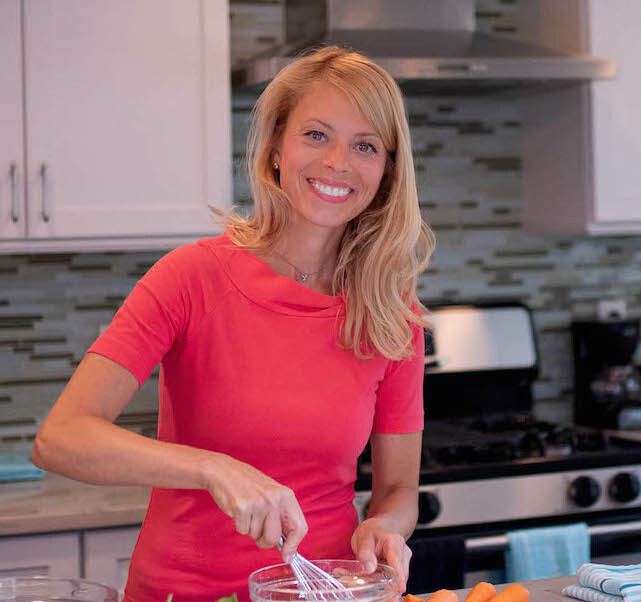 You can make them ahead and freeze them for up to 3 months. 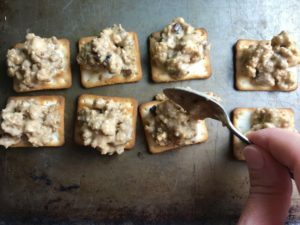 Then simply lay them out on a sheet pan frozen and cook them in the oven until the bread/cracker toasts up and the topping is melty. Then serve on a platter and watch your guests go crazy for them! WHY ARE HANKY PANKY CANAPES THE BEST PARTY APPETIZERS? The name is Hanky Panky! (FYI, I did research the origins of this name, but all I could find is that it came about in the early 1970’s in the midwest and the name was likely derived from some fun ‘swinging’ parties). They include Meat, Cheese, and Bread. Probably enough said, but here are a few more reasons! They are make-ahead apps. 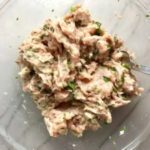 You can make them up to 3 months in advance and keep in the freezer, then pull them out and cook in minutes for a snack, for last minute guests, or for a planned party. They are super EASY to make. Everything gets made in 1 skillet or pot and then you top bread or crackers and freeze. This recipe is updated with real ingredients. The original recipe included a very processed shelf-stable cheese. 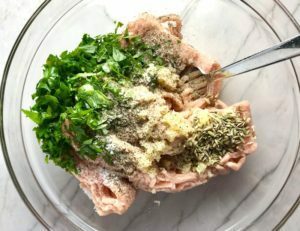 My recipe swaps that out for shredded real cheddar along with some cream cheese for creaminess. You can make them Gluten Free. 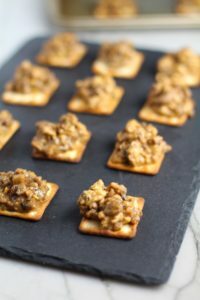 While the original recipe used cocktail rye breads, I have used Gluten Free Crackers that I tested and work beautifully after freezing and cooking! My Grandma and my Mom made them since I can remember. Generations of Moms cannot be wrong! The traditional recipe includes a combo of Pork Sausage and Ground Beef. 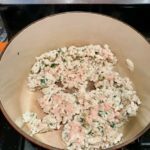 My version replaces the Pork Sausage with a homemade Lean White Meat Ground Chicken Sausage mixture. Mix all Sausage meat ingredients in a bowl. Either store in fridge until ready to cook or keep going on to the cooking the meat. COOK THE BEST PARTY APPETIZERS! HANKY PANKY TIME! This recipe is great because it’s so easy! 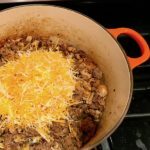 Everything gets layered into one large skillet, soup pot, or dutch oven. Start by browning the Chicken Sausage Meat. I mean, REALLY browning it. Separate it, then don’t touch it for 4-5 minutes until it gets really, really browned. Then stir and add in the ground beef. Stir again to combine and let the beef cook through. Then add the cream cheese and shredded cheese, stirring until thick and creamy. The traditional base for Hanky Panky is a Cocktail Rye Bread. However, I think they are a little big for a heavy appetizer like this and I wanted to find a crispier Gluten Free base. 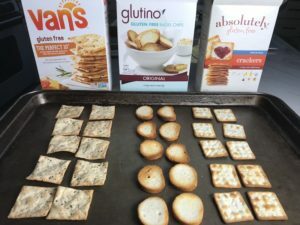 I tested 3 Gluten Free Crackers that all worked well going into the freezer and being cooked up in the oven. However, my preferred option are the Absolutely Gluten Free Crackers, Original. They are the perfect size, not too salty, and because they are plain, they let the Hanky Panky Meat Topping stand out. On sheet pans that will fit flat into your freezer, lay out the crackers. Place a small amount of the cooled mixture on top of each cracker. Once all are topped, lightly cover and seal with foil or plastic wrap, and place in freezer. Once completely frozen (approx. 6 hours) transfer gently to a freezer container or freezer bag. When you are ready to serve, preheat your oven to 375 F degrees. 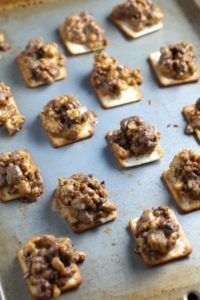 Remove the Hanky Panky Canapes from the freezer and place on a lightly oiled sheet pan. Cook in the oven for 12-14 minutes, until warmed through and the crackers are crispy. 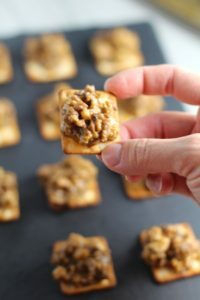 These Hanky Panky Canapes are the BEST Party Appetizers around! They're cheesy, meaty, and absolutely delicious. Ground Beef is mixed with Homemade Chicken Sausage and then combined with lots of cheese until its a creamy addictive pot of goodness. Then it's scooped on top of bread, toasts, or crackers. Chop 3 Tbsp Parsley. Mince 2 cloves garlic. 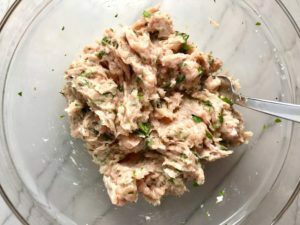 To a medium mixing bowl, add the ground chicken, minced garlic, the chopped parsley, 1 tsp of fennel seed, 1 tsp Salt, 1 tsp fresh ground pepper. Mix to combine. Either store in fridge until ready to cook or keep going. Preheat a large pot or dutch oven. Add a tbsp of olive oil and then add the ground chicken mixture. 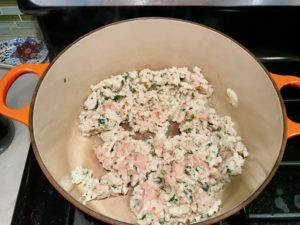 Separate the ground chicken to break it up into small pieces and then let it sear to get browned for about 4-5 minutes. Next, stir in the ground beef along with another 1/2 tsp of salt, 1/2 tsp of ground pepper, and the oregano. Let cook for about 6-8 minutes more stirring every couple minutes to ensure the meat cooks completely through. Turn the heat to low and add the cream cheese to the meat mixture. Stir the cream cheese to combine. Add the shredded cheese and stir to melt and combine. Once the meat and cheese are completely combined into a creamy and very thick mixture. Remove from the heat. On sheet pans that will fit flat into your freezer, lay out the crackers. Fit as many as you can on the sheet pan. Try to keep them from touching so they do not freezer together. Once the meat and cheese mixture has cooled enough to handle, start placing a small amount of the mixture on top of each cracker. Once all are topped, lay a piece of aluminum foil over top, seal, and place in freezer to freeze. Once completely frozen (approx. 6 hours) transfer gently to a freezer container or freezer bag. That name alone should be the reason I make this recipe – LOL. 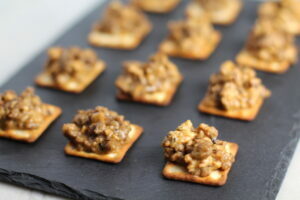 But on another note what a great appetizer for all the holiday parties that will soon ensure. I love anything that is “make-ahead” and easy. Thanks for the post, Carrie!